If you are interested in big game fishing, this massive book is definitely worth a look, chiefly because it is so superbly produced. The quality of the reproduction is so fine that it is difficult not to admire the design; but it is the content that makes this such a valuable work. The one word of warning I would have is that this is very definitely a history, rather than a book on fishing per se, and as long as you know what to expect, you will be as pleased as I was to read it. Saltwater Game Fishes is divided into three parts. The first describes the naturalists who identified and classified the important game species; there are accounts here of Linnaeus, Bloch, Cuvier, Yarrell, illustrated by reproductions of their own drawings. 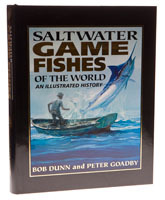 The meat of the book is an account of the fishes themselves, from their discovery to the the present time, with the focus very much on taxonomy rather than angling – and the final part of the book is a history of game fishing, which runs to sixty five pages. This should be a compulsory purchase for all angling historians, because it is quite simply the most authoritative work on the subject, but it has attractions for anyone who is interested in the sport.